PARIS and NEW YORK, Jun. 29 /CSRwire/ - EcoVadis, the leader in business sustainability ratings for global supply chains, today announced the results of its study “Sustainability Clauses in Commercial Contracts: The Key to Corporate Responsibility”, finding that, while CSR clauses are widely used and have strong potential for improving supply chain sustainability performance, current practices need improvement to truly impact change. 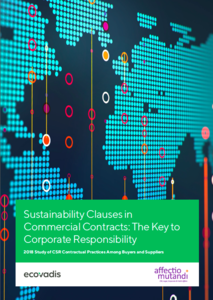 The study also identified numerous clause types and found large discrepancies in how they are applied, indicating that the current state of CSR clauses is still opening many companies to risk. This led to the development of four key criteria for constructing more effective CSR clauses: precision, verifiability, enforceability and coverage depth.